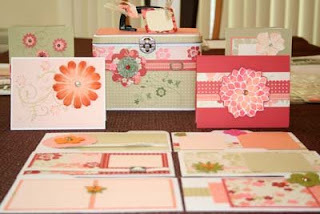 This image represents a finished project: Purse Tin box, 4 cards (we did two of each), and 6 tabbed inserts. The above posts will have the recipes and instructions for each piece of the project separately. Nice job, so detailed and a lot of work for you. It was a rather large project, lots of pieces, but all in all I kept all the pieces elegant but simple, where they just needed to be adhered together. However, I used a lot of embellishments to "jazz" it up - Flower Fusion, Rhinestone Brads, ribbons, chipboard, and designer series paper.